Binxy Baby is just one of the three shopping trip essentials for you and you family! Photo: Binxy Baby. If you’re an on-the-go parent, you know how challenging it can be to have your little ones tag along with you on your errands. From tantrums in the toy aisle, to sneaking snacks into your cart, a short shopping trip can take a lot longer than you originally planned. While it may seem impossible, these three products are huge game-changers for your next trip to the store! 1. Molo & Candy Lane Kidz: Say goodbye to your embarrassment over bringing your child to the store in his or her pajamas. Your little one will be more stylish than you in the awesome outfits from Molo or from Candy Lane Kidz. Both these brands supply fashion-forward clothing for boys and girls of all ages! Molo specializes in wallet-friendly trends that are flexible, high-quality, and detailed. Candy Lane Kidz is on the pricier side, but perfect for treating your kiddos to something nice! You can’t go wrong with any item from either of these brands. 2. Binxy Baby: Carrying around your car seat or lugging a stroller along is not always practical or easy. It’s even more challenging when you have more than one baby with you! The Binxy Baby Shopping Cart Hammock really changes shopping as you know it. This revolutionary invention uses strong cups and a super secure harness that hook on both sides of the cart. 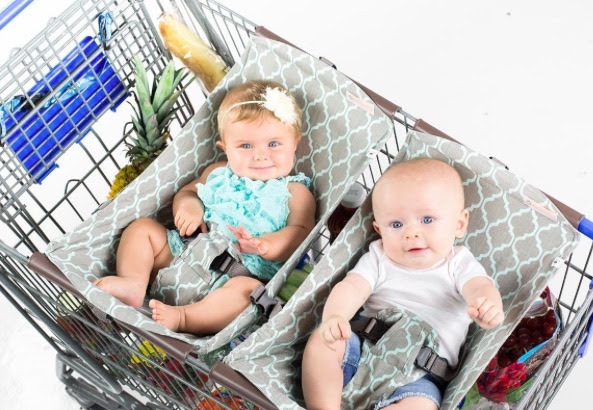 Your baby will be safe and comfortable while you grab those groceries! Serena Williams and Heidi Montag love Binxy Baby and use it to cart around their celebrity babies on their trips to the store. 3. Maddy & Maize Popcorn: Sometimes, all your kiddos need is a snack to pacify them. Maddy & Maize Popcorn is the perfect solution, as long as your kids are over five years old. These snacks are awesome because they are all-natural, non-GMO, have no artificial ingredients or preservatives, and are made with organic ingredients. They have very yummy flavors that your kids will love – aged white cheddar, cookies and cream, birthday cake, and more! The popcorn is made in small-batches, which makes it perfect to pack in your diaper bag, too. You deserve a easy and breezy shopping trip, especially when you have your kids tagging along. Do yourself a favor and bring these products into your life! May all your trips to the grocery store be tear-free and forever happy.